"This data is exciting in that it suggests that immersive environments could offer new pathways for improved outcomes in education and high-proficiency training," says Amitabh Varshney, professor of computer science and dean of the College of Computer, Mathematical, and Natural Sciences at UMD. Varshney leads several major research efforts on the UMD campus involving virtual and augmented reality (AR), including close collaboration with health care professionals interested in developing AR-based diagnostic tools for emergency medicine and VR training for surgical residents. For the study, the UMD team used the concept of a "memory palace," where people recall an object or item by placing it in an imaginary physical location like a building or town. This method—researchers refer to it as spatial mnemonic encoding—has been used since classical times, taking advantage of the human brain's ability to spatially organize thoughts and memories. "Humans have always used visual-based methods to help them remember information, whether it's cave drawings, clay tablets, printed text and images, or video," says Krokos, who was lead author on the paper. "We wanted to see if virtual reality might be the next logical step in this progression." Next, Krokos asked the users to memorize the location of each of the faces shown. Half the faces were positioned in different locations within the interior setting—Oprah Winfrey appeared at the top of a grand staircase; Stephen Hawking was a few steps down, followed by Shrek. On the ground floor, Napoleon Bonaparte's face sat above majestic wooden table, while The Rev. Martin Luther King Jr. was positioned in the center of the room. The key, say the researchers, was for participants to identify each face by its physical location and its relation to surrounding structures and faces—and also the location of the image relative to the user's own body. In post-study questionnaires, all 40 participants said that they were completely comfortable—and adept—in navigating a desktop computer to access information, yet all but two said they preferred the immersive VR environment as a potential learning platform. The questionnaire also found that only two people said they felt "uncomfortable" using VR. Many of the participants said the immersive "presence" while using VR allowed them to focus better. 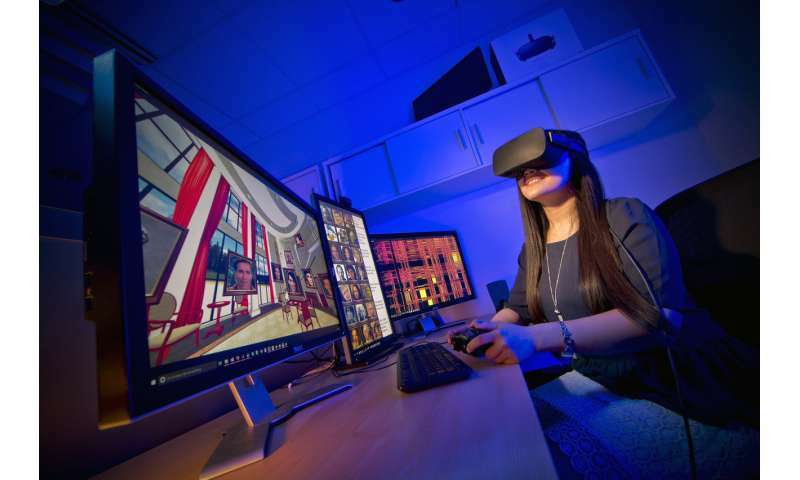 This was reflected in the research results: 40 percent of the participants scored at least 10 percent higher in recall ability using VR over the desktop display. "This leads to the possibility that a spatial virtual memory palace—experienced in an immersive virtual environment—could enhance learning and recall by leveraging a person's overall sense of body position, movement and acceleration," Plaisant says. "By showing that virtual reality can help improve recall, it opens the door to further studies that look at the impact of VR-based training modules at all levels—from elementary school children learning astronomy to trauma residents acquiring the latest knowledge in lifesaving procedures," Varshney says. "We believe the future of education and innovation will benefit greatly from the use of these new visual technologies."